I met with two ESL students today for private lessons. Today was one of those days where I doubted my effectiveness as a tutor. I have been working with one of today's English language learners for several months. He is mostly working on his business English skills. He is making a lot of progress, especially in the area of writing effective emails. During our sessions, he takes notes of the mistakes he has made and the improvements we make to his writings. He then studies these notes between our sessions and applies what he has learned. I have been working for only a few weeks with the other student. Unfortunately, I don't feel like he is making any improvement. Of course, we have only met a total of six times, so I should probably allow more time for an assessment. However, I still doubted my effectiveness and the choices I was making for lesson plans. I have to remind myself that I am only in control of the lesson plans that I make and the job I do of teaching. Learning a new language is something that cannot be done in only one or two lessons per week. Ultimately, it's the student's responsibility to learn what is being taught. Currently, Fridays are my "long days." I teach three ESL students in a row. Each lesson lasts an hour-and-a-half and I see my students back-to-back. I used to take 15-minute breaks between students, but I found that that just made my day too long. Non-tutors may think that a four-and-a-half-hour work day is pretty easy, and it is, somewhat. However, when you have a "regular" job, especially in an office, you don't always have to concentrate for extended periods of time. You can check your personal email, surf the web, call a friend... And if you are focusing on work, you can move around, change your tasks, etc. Not all jobs require your complete concentration the entire time. Tutoring, and most classroom teaching, requires solid concentration. The other difficult thing is having to sit for so long. By the end of my work day, my back is usually thrashed. It takes a little while to recover from sitting so long. OK. That's my list of woes for today. I guess it's not so bad. No matter what country you are from, and whatever language is spoken in your country, there are unique physical gestures that are familiar to almost everyone in the country. Although some gestures cross borders, others do not. In fact, simple hand gestures may have very different meanings in different countries. Awhile back, I was on a train with an American friend and an Iranian friend. The train was nearly full and we had difficulty finding three seats together. My American friend was at the other end of the train. My Iranian friend used a hand gesture to tell her to come to us. My American friend smiled and waved at her. I then gestured to my American friend and she came to us right away. We were both using “come here” gestures, but my gesture worked for Americans and hers worked for Iranians. While gestures may not need a lot of time in the in the ESL classroom, I believe that they are a part of an ESL teacher’s responsibility to bring to the attention of ESL learners. One way to do this in an ESL classroom is to ask students to show, for example, how they would ask someone to come to them using physical gestures. Then the teacher can show how it’s done in the English-speaking country that they are in. Of course, this is only a small bit of a lesson. The main point is that gestures are a part of effective cultural communication. Both have their pros and cons from the teacher/tutor’s perspective and from the students’ perspective. Speaking as a teacher who has done both, one of the biggest differences I notice is that in a private tutoring situation, the ESL learner has more input into the curriculum. I always do a free Needs Assessment of each potential student. It’s during this time that I analyze the areas of improvement that I feel would help the student, but I also pay a lot of attention to what the student wants to improve and the reasons he or she wants to improve. I then design a curriculum for the student based on this needs assessment meeting. In a private tutoring situation, I’m free to change the curriculum as needed, so I keep the curriculum pretty loose. We may start out in one direction and I may find after a lesson or two that the student really needs more immediate help in another area. Another difference between teaching in the classroom and teaching private lessons is that if something comes up in a tutoring session that I haven’t prepared for, that’s OK. I have enough experience that we can deviate from my lesson plan, if needed. (Flexibility is really one of the keys of a successful and happy ESL tutor.) I wrote yesterday about “air quotes.” I had a student a few days ago who wanted to know about these. It wasn’t a part of my lesson plan, but because it was just the two of us (as opposed to a whole classroom of students), we were able to deviate from my planned lesson. The last difference between private ESL tutoring and classroom teaching, from the perspective of the teacher/tutor, is that the ESL student is, in many ways, “the boss.” After all, he or she is paying good money for the lessons. Of course, the ESL learner is also paying for my expertise in English; and he or she is also paying for my expertise in American culture. (This is one of the reasons many English language learners prefer a “native speaker.”) In an ESL classroom, the curriculum is usually dictated by the school administration and must be strictly adhered to. I appreciate the flexibility I have in being a private ESL tutor. You know. When we take our first finger and middle finger of each hand and drawing the quotes in the air when we say certain words or phrases. It’s easy enough to show your ESL student how to do this, but describing when to use them is more difficult. At least it was for me with a student yesterday. According to Wikipedia, air quotes are used “express satire, sarcasm, irony or euphemism.” I think this definition will help when I go back to my ESL student today and further try to define this concept to him. I haven’t found air quotes in any ESL curriculum or lesson plans, but I think if it comes up in the classroom, it is a teacher’s responsibility to teach these little cultural “gems.” Knowing such things helps to enhance a student's communication and speaking skills. Does anyone remember the Friends episode where Joey kept using air quotes incorrectly? Finally, by the end of the show, he was able to use them correctly. Teaching Simple, Progressive and Perfect tenses involves teaching “helping” or “auxiliary” verbs (what they are called depends on the grammar book or the teacher). Conjugation of the helping verbs needs to be taught before the more complex Progressive or Perfect tenses; and certainly before the Perfect Progressive tenses! The helping verb for Simple tenses is “to do.” Here are some examples. I do not want to work so hard. He didn’t like the dessert. The helping verb for Progressive tenses is “to be.” We use “am,” “is” or “are,” and “was” or “were.” Here are some examples. I am eating dinner. I was eating dinner. She is eating dinner. She was eating dinner. They are eating dinner. They were eating dinner. The helping verb for the Perfect tenses is “to have.” Here are some examples. I have traveled to France. We will have traveled to 20 countries by the time we return. These are only a few examples using helping verbs. The main point here is the importance of “to do,” “to be,” and “to have” and how ESL students must know how to conjugate these verbs before they can thoroughly learn each of the English verb tenses. One other note. Some authors will refer to modals (e.g., should, might, may, etc.) as helping verbs. I’m using the term here to refer to those verbs that are needed in order to form all the English tenses (namely, “to be,” “to have,” and “to do”). Yesterday, I wrote a little about the modal “should” and the false modal “had better.” But what is the definition of modals and how are they used? Modals are words like “can,” “must,” “will,” “should,” “might,” etc. There are actually a lot more than this little list. Azar’s, Understanding and Using English Grammar has a great table of modals with different tenses and explanations of how they are used. I always make a copy of this for my ESL students. Most English grammar resources list “had better” with modals. Technically, it’s not a modal but acts very much like one. When I teach modals to my ESL students, I always include “had better” in the lessons. Well, today I met with a new student for our initial assessment meeting. She is a very advanced ESL student. She wants to improve her speaking skills and writing skills, as well as learn idioms and how to make small talk; AND she wants to sound like a native speaker. A pretty full plate. And guess how often she wants to meet and how many times per week? Once a week for one hour. I gave my warnings, but this is what she wants to try. I sometimes wonder if I should refuse students who can only commit to one hour per week. Being self-employed, it's probably not a good idea. But to do justice to the student, I do my best to inform them of the progress they can expect with only one hour of instruction and practice per week. I had met with a particular student once a week for about four or five weeks. During our assessment meeting (I always offer a free assessment meeting to potential students—it also gives us both a chance to decide if we would like to work together), the student said that she wanted to improve her spoken English. Her skills were quite advanced, but she wanted to improve more and have an opportunity to speak English, because she speaks her native language at home and with most of her colleagues. Yesterday, she emailed to apologize and tell me that she did not have time to continue classes; also, she felt that since she was not able to practice English outside of class, she did not feel that her English was improving. In my advertisement for new students, and at my first meeting with new students, I highly recommend to students that they take at least two English classes per week if at all possible. I tell them that the difference between one class and two is often the difference between no improvement (if taking only one class per week) and substantial improvement. I had warned this particular student of the same thing, but she wanted to try anyway. And now she has given up (for now). I have had one student that I met only once a week for several months; and his English skills progressed a lot. However, he was willing to do a substantial amount of homework during the week; and when something immediate and really important came up (like preparing for job interviews), we temporarily increased our meetings to two to three times per week. When taking on new students, I highly recommend that English tutors stress the importance of doing more to improve their English skills than meeting with a tutor one time per week. The “more” could be taking additional classes, doing homework, making sure to practice English skills everyday, etc. 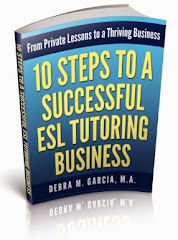 As a self-employed tutor, I generally do not turn away ESL students who can meet me only once per week. Most of my students are working adults, and one time per week is all they can manage. However, I am very clear with my students about what is possible by only having one meeting. Learning a language is not a once-a-week endeavor, and I want to make sure that my students know the best ways to improve their English skills. And I also do not take it personally if I do not see significant improvement. I am always sure to do my part, but the learning is the student’s responsibility. Just as with any profession, ESL teaching has a list of acronyms and terms that are specific to this field. The most common are ESL and EFL. ESL stands for English as a Second Language and EFL stands for English as a Foreign Language. TESOL stands for Teaching English to Speakers of Other Languages. This term is more recent and often encompasses both ESL and EFL. TOEFL and TOEIC are also commonly used acronyms in the TESOL profession. TOEFL stands for Test of English as a Foreign Language. Many foreign students must do well on this test to qualify for American universities. TOEIC stands for Test of English for International Communication. This test is often required by non-native English speaking countries to test English proficiency of potential employees. I came across an old grammar joke on an English forum I visit regularly (it's listed under "Resources I Use"). A reader asked which is correct: "It is I" or "It is me." Grammatically, the correct answer is "It is I." Common usage, and therefore the one I use, is "It's me." St. Peter (at the Pearly Gates of Heaven): Who is it? St. Peter: Go to hell, we already have all the English teachers we need! When teaching progressive tenses (“to be” + “—ing”) to ESL and EFL learners, you also have to teach students that some verbs cannot be used in the progressive form. For example, “I am knowing him for a long time.” This is not correct because the verb “to know” is a stative verb. Another example, “It is belonging to me.” This is also incorrect because the verb “to belong” is stative. A stative verb is one that is used to talk about states of being or conditions. For example, “This flower smells good.” The state or condition of the floor is a pleasant smell. I can’t say, “The flower is smelling.” At least, I can’t say it and be grammatically correct. Two areas are confusing for English language learners. The first is that some words can be used in progressive forms and in stative forms. For example, “I have a car.” I can’t say, “I’m having a car.” But I can say, “I’m having a party tonight.” Different meanings. The next thing that is confusing is that many times even though a verb is stative, some native speakers will use it in the progressive. Most native speakers instinctively know when we can get away with using a stative verb progressively. For example, “realize” is supposed to be a stative verb, but many people may say, “I’m realizing how much she means to me.” And it makes perfect sense. Then there is the McDonald’s commercial that says, “I’m lovin’ it.” Ugh! “Love” is a stative verb! Interestingly, the word “stative” is not recognized by MS Word and most native-English speakers do not know this word, but we intuitively know the concept. As with most of the English language, I suppose. When I teach my adult ESL students the rules for adding a syllable to past tense verbs that end with a /t/ or /d/, I often use the word “syllable,” of course. I have found that about 50% of the time “syllable” is a new word, and sometimes a new concept, for my adult students. Now I no longer make the mistake of assuming that students know the words (sometimes called the “metalanguage”) that I use to talk about the language. After all, ESL and EFL teachers should really use a minimum of metalanguage when teaching English. It’s just so much easier to take these shortcuts that sometimes I have to remind myself that my students are, after all, coming to me to learn to speak or communicate in English, not to learn to speak about English. Many non-native English speakers think Americans speak really fast. While this may be true for some people, what tends to happen more is that native speakers use contractions (e.g., I did not = I didn’t) and reductions (e.g., I’m going to = I’m gonna). Contractions are usually taught when English language learners study English as a foreign language in their home countries, although most non-native English speakers need more practice in this area. However, reductions are seldom taught, with the exception of “gonna” and “wanna.” Most of my students, especially Korean students, are good at using these two reductions, but not others. Other common reductions used by native English speakers are “shoulda,” “coulda,” and “woulda.” There are a couple of steps to get to these reductions. First, the student must be taught to use the contraction “should’ve,” for example. After the student is comfortable with this contraction, you can introduce the reduction “shoulda.” You don’t really need to teach it step-by-step, but I’ve found that a lot of students are uncomfortable with what they think is improper English. It sometimes takes a little convincing that contractions and even most reductions are correct and are used by, even, educated people. Another reduction I heard once is a big jump, even for me! I’ve heard some people turn “I am going to” into “I’m’n’a.” I don’t even know how to write that out! In addition to the two basic functions of the Present Progressive (to talk about something happening at this moment and to talk about something happening generally at this time), the Present Progressive verb tense can also be used to talk about the future. Q. What are you doing tonight? A. I'm having dinner with my mother. Q. When is she coming home? A. She is coming home this weekend. This usage is similar to "be going to," which is also used with a Simple Future meaning. Q. What are you going to do tonight? A. I'm going to have dinner with my mother. The meanings are the same and can be used interchangeably. The adult ESL students I work with as a private tutor have very specific purposes for improving their English language skills. Usually, the main purpose is to be able to advance in their jobs. This applies to ESL students living and working in the U.S., as well as those who are here for a year or so on a sabbatical (of sorts). Elderly students who are no longer in the workforce have different needs and different reasons for studying English as a Second Language. In my experience, it's usually to be able to survive in an English speaking society. For whatever reasons, they are recent immigrants who often have not studied English in their home countries. Doing a Needs Assessment with a student with little or no English language skills is very difficult. Obviously, there are some basic skills that the teacher can start with. I found this great website with information that can help ESL teachers and tutors, and other organizations working with recent immigrants. Here's their site: Coalition of Limited English Speaking Elderly. When I take on a new student, I require that they sign an ESL tutoring contract and, at our first class, they must pay for that class and an equal amount that I hold as a deposit. I then apply the deposit to our last class together. The other purpose of the deposit is to ensure that students keep their appointments or give me adequate cancellation notice. I require 24-hour notice for cancellation. If the student doesn't show up for class, then I apply the deposit to the missed class. The other issue about payments for ESL lessons is whether to take checks or cash, or only one of the other. I allow my students to pay in whatever way is convenient for them. In over two years of private tutoring, I have never had a problem with receiving checks. Unfortunately, I had my first bounced check last week. This check was from a long-term student, so this was highly unusual. I guess it's just one more of the issues to deal with when you are self-employed. I'll be meeting with this student on Friday. Mistakes happen. We'll deal with it. Even for the most advanced ESL students, propositions can always use more practice. Many verbs are (usually) followed by certain prepositions. Some even entirely change the meaning of a verb by turning it into a phrasal verb. ESL learners just have to memorize most prepositions, especially those that follow certain verbs (and even more so for those that create phrasal verbs). Some prepositions can be used interchangeably depending on the situation. This just adds more confusion for people learning English. Prepositions of place, perhaps, are among the most consistent (that is, they have fewer exceptions). Prepositions of place are almost logical, if you can understand the preposition on its own. To help reinforce students' learning of prepositions, you can always use ESL preposition worksheets. 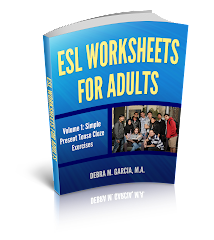 There's at least one at Free ESL Worksheets. This is a link to a page with worksheets on my ESL website. If you're thinking about becoming an ESL teacher or tutor, you can ask yourself if you have the characteristics of a good teacher. Here are the top 10 qualities or characteristics I think are essential for an ESL teacher or tutor. Here’s a more thorough description of an ESL teacher. What are the duties of an ESL teacher? The primary duties of an ESL or EFL teacher are to prepare lessons plans and deliver those lesson plans to speakers of other languages (ESOL) who want to improve their English language skills. This is the most simplistic description of the duties of an ESL teacher. Other duties will depend on the type of setting in which the students are taught. For example, are the ESL students at a university, at a primary school, at a non-profit organization, a private language school? The additional duties of ESL teachers will depend on the setting and will most likely be administrative tasks, such as taking attendance and participating in departmental meetings. Here’s more information about the duties of an ESL teacher. This question comes up a lot on internet searches. For native English speakers, it’s a pretty simple word. But the trick for ESL learners is that there are three possible endings for past tense verbs: /t/, /d/ or /id/. So which ending is right for this –ed ending word? Check out my English Past Tense Pronunciation page for the pronunciation rule for “walked” and other past tense words (or past participles). Are private English schools good places for ESL teachers? Hmmm. Well, in my personal experience, they are a good place to start out. If your main qualification is that you have a TESOL or CELTA certificate, many private language schools will hire you with little to no experience. You can start to get experience to put on your resume and you’ll be able to start putting all the stuff you learned in your certification course into practice. Those are the good sides. For me, the downsides outweigh the advantages, especially if you work in a metropolitan area where there are a lot of language schools. And note that where there are a lot of language schools, there are also usually a lot of teacher certification schools. Sometimes they will be the same school. However, working in an area where there are a lot of teacher training programs means that private English language schools will always have a steady supply of new teachers. This means that they don’t have to offer decent pay, benefits, or even preparation pay. The working conditions are also not always ideal. For example, the director may not tell you what class you are teaching until the night before, or worse, the morning of the class. (This is because they often don't know how many students they'll have and what the levels are until the last minute.) This give you very little time to prepare. If you've done it for a while, then it won't be as big a problem, because you can just use a lesson plan you've already developed. For new teachers, this usually isn't possible. So if you have little or no experience or if you have other forms of financial support and are just looking for a little supplemental income, then a position at a private English language school might work for you. But it probably won't be easy. Some of my advanced ESL students have been doctors or nurses. Most have been visiting the U.S. for the purpose of improving their general English speaking skills. However, I have had nurses who live in the U.S. and needed to improve their English language skills for their jobs. Medical English is a real specific field of English. It’s obviously English for a specific purpose. While I have had many different experiences in business and other areas, my closest contact to the medical profession has been infrequent visits to the doctor. I needed additional ESL resources to prepare lesson plans for these students. That’s why it was wonderful to come across a great website with medical English. HospitalEnglish.com is a useful site for ESL teachers and medical professionals who are not native-English speakers. I currently have an advanced ESL student who wants to improve his writing skills. He has also asked for recommendations for books to buy before he returns to his home country. English grammar books and English books, in general are obviously easier to buy here in the U.S. than in non-English speaking countries. Among the other books that I recommend to ESL teachers and advanced ESL students, I also recommended the classic Strunk & White’s, The Elements of Style . Most of you are probably familiar with this little gem of a book. For those of you who aren’t, it’s a great little book of English writing rules. It’s short and small and pretty complete. I don’t know if this is a typically recommended ESL book, but I think it’s very useful for advanced English language learners. I’ve had more than one advanced ESL student (and a beginner or two) ask about the use of the word “though” during our tutoring sessions. Usually, it’s based on something I’ve just said during our class. They sort of get if from the context of what’s being said, but it’s very difficult for me to explain how to use this adverb. My favorite Longman’s Dictionary defines “though” as “used at the end of a sentence to add a fact or opinion that makes what you have just said seem less important, or to add a very different fact or opinion.” Well, yeah, that’s true. But I haven’t been able to figure out how to effectively teach ESL students how to add this use to their conversation skills. The best I’m able to do is to point out when they could use “though” when they are speaking with me. He’s a rotten husband. He’s good to his children, though. She drives too fact. She’s never gotten a speeding ticket, though. The examples may seem a little strange in writing. “Though” at the end of a sentence is really something that belongs more in spoken English. subject + will have been + -ing. The Future Perfect Progressive can often be used interchangeably with the Future Perfect with no difference in meaning. This is the confusing part for ESL students. When teaching English language learners this tense, reinforce the fact that it is used when you want to emphasize the duration of the activity that is or will be in progress until a future time or event. More information on ESL Future Perfect Continuous. The Present Perfect Continuous (also called the Present Perfect Progressive) is used to talk about something that began in the past and continues until now. You may notice that this is also one of the three functions of the Present Perfect tense. This can be a little confusing for ESL or EFL students. The thing to point out to English language learners is that the Present Perfect Continuous is used when you want to emphasize the duration of the activity that began in the past. subject + have/has been + -ing. More information on the Present Perfect Continuous. subject + had been + ing. The difference between the Past Perfect Progressive (also called the Past Perfect Continuous) and the Past Perfect is that the Past Perfect Progressive emphasizes the duration of an activity in the past before another activity or time in the past happened. It’s also used to talk about something that was going on in the past close in time to another activity. I had been sleeping for an hour before they woke me up. They had been studying English grammar for one year before they felt comfortable speaking English. She had been teaching ESL for seven years when they asked her to lead the English Department. She had been jogging in the rain. That’s why she was all wet. More info on the Past Perfect Continuous tense.